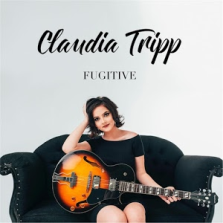 Fugitive by Claudia Tripp is a six track EP and was released online on 11th March 2017. Listed on Google Play Music as being Pop, and on iTunes as being Country/Pop, I would say this EP is definitely more pop than country, in fact I might go as far to say it has a hint of soft rock about it. If you like your music with a little more oomph, then this EP could be just up your street. The first track is the title track "Fugitive", and it starts off slow, but at 47 seconds, it really takes it up a notch. If you are anything like me, then at that point you are hooked and wanting more. Like a lot of music, the EP is mainly about the trials and tribulations of love, love lost and heartbreak. The production is exceptional, the vocals are crystal clear and can always be heard over the music. All too often the music on songs can be a little loud, kinda drowning out the main part, which is the vocals. This EP really gets everything spot on though. I personally love ths EP a lot and I'm playing it at least twice a day. Claudia has really accomplished something with this release. Fugitive by Claudia Tripp is available to download or stream on all of the usual sites/platforms and a physical copy can be bought from Claudia Tripp's Bandcamp page.